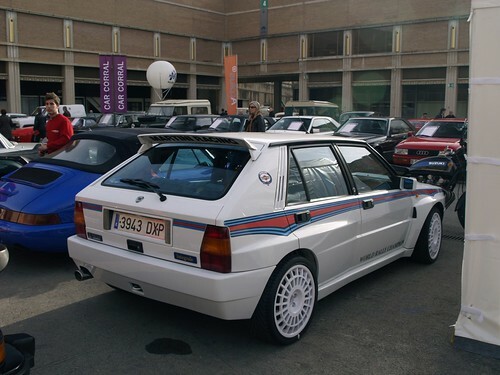 I have been told of a practically new Martini 6 limited edition Delta HF in Italy. It has just been serviced and ready for road use, having been stored since new.. I think mileage is almost delivery, and is as new.anyone interested? Price is around Eur.60, 000! Excuse my ignorance, but is this a proper Martini 6 livery ? Short answer is I don't know but it's certainly different to the 5 I have a picture of. Is probably the best person to ask. As far as I can tell yes, the 5 has a black aerofoil and the side graphics are different. Sorry can't see enough to tell, the side stripes are different on the Martini 5, the sportline logo does not belong on the c pillar it should have HF logo. Any cahnce of a more detailed photo? Will look for a bigger picture. it's a model but graphics are normally accurate. Going off the John Whalley info and Walkers combined, my own personal opinion is these model graphics seem to be spot for the Martini 6. Still couldn't see the Lancia Logo on the roof? Otherwise it all seems to be there. As far as the stripes on the martini cars go, martini 5 the stripes fan out as they reach the back quarter, martini 6 stripes break into a point over each wheel arch. best place for the correct stripes is here. This pic from that site does look spot on. Again though, rear uprights, HF badges? And martini badge on the lip of bonnet?